Visitors have accessed this post 68450 times. 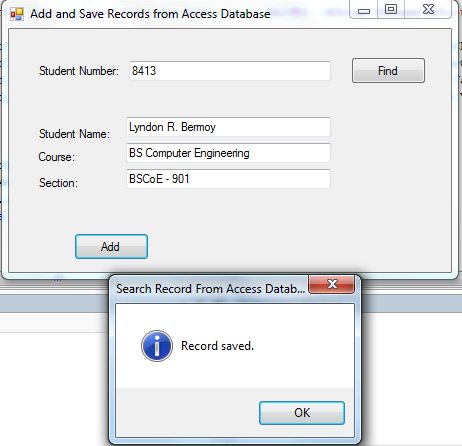 This is a continuation of my other tutorials entitled Search and Retrieve a Record from Access Database and VB.NET. But here, we will focus on adding and saving a record into an access database. 1. Create an access file with the table and entities like the image below. 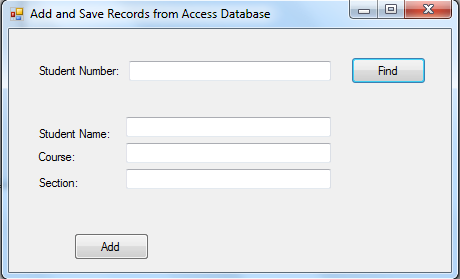 Name your access database as sample.mdb(2003 format). 2. Create a Windows Form Application in VB.NET for this tutorial by following the following steps in Microsoft Visual Studio: Go to File, click New Project, and choose Windows Application. 4. Create a module in your project and named it, modConnection. Import Imports System.Data.OleDb library. This library package is for ms access database. In your module connection, initialize the following variables. Now, create a method named connection to have the connection string. This will locate the sample.mdb access database that we have created earlier. .ConnectionString = "Provider=Microsoft.Jet.OLEDB.4.0;Data Source=" & Application.StartupPath & "\sample.mdb"
Full code of the modConnection module. 5. Back to our form, put this code for the form_load. We will call the connetion() method that we have created in our module. Because we all know that module is access throughout the entire program. 6. For the btnAdd as adding and saving records to database button, put this code below. We will first create a try and catch method to have the exception handling. Here, we will use the OleDbCommand with the method of connection, CommandType.Text, and CommandText, with the OleDbDataReader to execute the CommandText. Note: The sql syntax "INSERT INTO tblStudent (Snum,Sname,Scourse,Ssection) VALUES (@Snum,@Sname,@Scourse,@Ssection)" is for adding and saving of records to the database. Snum,Sname,Scourse, and Ssection are our entities and @Snum,@Sname,@Scourse,@Ssection are our parameters. .CommandText = "INSERT INTO tblStudent (Snum,Sname,Scourse,Ssection) VALUES (@Snum,@Sname,@Scourse,@Ssection)"
Now, have your parameters hold the value inputted in your textboxes that you have created earlier in the interface. To run the command of our parameters put this code below. Execute the non query and have a message of "Record Saved" after execution. Clear all the textboxes after saving the records. And don't forget the Exit Sub command at the end of your Try method. This will terminate the sub process of trying to add again another record. Then to catch the error, put this in your catch method. Here is the full source code of our tutorial for adding and saving records with search also. .CommandText = "SELECT * FROM tblStudent WHERE (Snum = '" & txtSearch.Text & "')"
The database is located inside the Debug folder of Bin. If you have some queries, feel free to contact the number or e-mail below. Why is this error" Microsoft.Jet.OLEDB.4.0" keep showing even though i follow every steps? Can you fix it? everything went well expect if i search for the student and then want to search for another student it wouldnt change the info. copy Call connection() on form load and past it on the button that execute the search records. the problem is that the collection has closed after executing the first command. 'TODO: This line of code loads data into the 'Masterdata_mdbDataSet.Machine' table. You can move, or remove it, as needed. Msg is Concurrency violation: the UpdateCommand affected 0 of the expected 1 records.